The Cameron Highlands Resort is one of the pieces of real estate owned by Tan Sri Francis Yeoh. TAN Sri Francis Yeoh has great entrepreneurial spirit and is fully behind the Government’s plan to improve the country through innovation and technology. “I think of blue ocean projects. But what was previously blue ocean has today become a must-have,” Yeoh says. Blue ocean business strategy refers to strategies that an organisation undertakes by creating new demand in an uncontested market space. “Whatever we do since 1955 have elements of blue ocean, be it the low-cost apartments or otherwise. If we are to build a population for the future, we will not build small five-storey walk-up apartments of about 600 sq ft and have a family of seven living in them. We are condemning them to a social slum (if we do that),” he says. Whether it is WiMax, or plain bricks and mortar, Yeoh carries with him this big picture of what he wants to do. Besides wiring up the nation of some 26 million, one of the must-haves that he would like Malaysia to have is that fast train connecting Malaysia with Singapore. Yeoh believes that the connection will help to close the gap of property prices between Singapore and Malaysia. “We have the most ‘unappreciated’ real estate. We have been very profitable in Singapore and I am not going to wait around wishing for property (prices) to go up (here),” he says. He has indicated that he will wait for prices to improve when asked about the lack of activity in Sentul, a nearly 300-acre site the group has undertaken to develop over a 10-year period since early this decade. The last launch in Sentul west was The Maple in 2003. 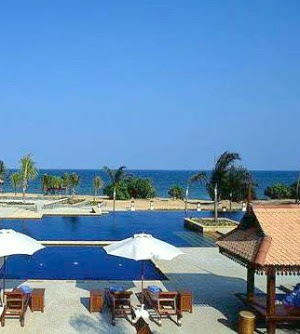 The award-winning Tanjong Jara Resort with its two swimming pools. The group unveiled the redevelopment of the Sentul area in late-1990s, after it took over the project from Taiping Consolidated Bhd and renamed it YTL Land & Development Bhd. The plan was to redevelop Sentul and improve its connectivity with train services. Although property prices have doubled in Sentul and in Pantai Hill Park in the Kerinchi area in the secondary market – YTL Land is developing in both areas – Yeoh is comparing property prices here with other countries in the region where prices have escalated much faster. To take advantage of buoyant property prices in the region, Yeoh wants YTL Land to go global by leveraging on the expertise of YTL Corp Bhd. Already, YTL Land will be developing Singapore’s Sandy Island and Kasara villas in Sentosa Cove and redeveloping Westwood Apartments on Orchard Boulevard. YTL Land’s global forays are part of its current ongoing restructuring exercise. “By the end of this year, YTL Land will become global, with a global CEO to run it. This will change the whole dynamics of YTL Land,” he says. Other than in Singapore, YTL Land will also be building a US$100mil (RM338mil) boutique resort on its Koh Samui land in Thailand. That is due to open next year. “Koh Samui will be the Mediterranean of the East. We will build hotels on the extra Koh Samui land,” says Yeoh. The restructuring of YTL Land follows the recent consolidation of the group’s hospitality and commercial assets under its two real estate investment trusts (REITs). On a current international branding exercise, Yeoh has put his hospitality and resort assets under the Malaysia-based Starhill REIT while Starhill Global REIT (SGREIT) groups his retail malls. Besides the group’s interest in Singapore’s Wisma Atria and Ngee Ann City, SGREIT also has interest in Japan, Australia, China and Malaysia. With him at the helm, SGREIT has expanded to cover 13 properties worth S$2.6bil in five countries. His aim is to establish SGREIT as the main YTL-linked vehicle for ownership of prime retail and commercial properties in Asia Pacific. Starhill REIT will be the country’s first hospitality and resorts trust with assets in Malaysia and abroad. Starhill REIT has a market capitalisation of US$289mil as at February this year and a portfolio value of US$443mil as at June last year. The Singapore-based Starhill Global REIT has a market capitalisation of US$747mil as at February this year and a portfolio value of US$2.1bil as at February. He has injected Niseko Village, which he recently bought for about RM205mil, into the Starhill REIT. The 617-ha ski resort is in Hokkaido, Japan. He also has The Muse Hotel in Saint Tropez, France which, soon after its relaunch, has become one of Europe’s 20 most popular new hotels. He bought that for between 20 million and 30 million euros. “Niseko will be the Aspen of the East. We bought into Saint Tropez in France because we wanted to take a French brand back to Asia. St Tropez will be the window to (our assets here),” says Yeoh whose assets, besides Wessex Waters in Britain, tend to concentrate in Asia. He has The Chedi, a resort in Phuket. He may soon be an acquisition trail globally for real estates. On the home turf, he already has some award-winning real estate. This includes Pangkor Laut Resort, Tanjong Jara Resort and Cameron Highlands Resort. His hotel brands are Ritz-Carlton, Spa Village, J W Marriott and The Majestic in Malacca. The group also has Malaysia’s fastest growing cement company in the country. It is the first ready-mix concrete company and the second largest cement company in Malaysia with annual production capacity of 6.1 million tonnes. YTL Cement has regional expansion plans and is evaluating investment opportunities in Indonesia and China. In 2008, it acquired 100% of China’s Zhejiang HangZhou Dama Cement.